One of the highlights of Sydney Tests is the dinner hosted by The Australian Cricket Media Association (ACMA) to present the Australian Cricketer of the Year Award at Sydney Football Stadium. 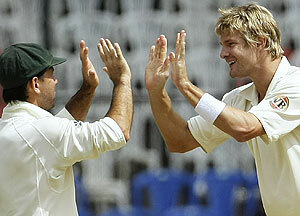 This year’s winner was Shane Watson. Brad Haddin was the winner last year and Mitchell Johnson the previous summer. As this was a Silver Jubilee Dinner, it had a special significance. The evening is more than just a dinner and prize presentation. It is an occasion where journalists and Test cricketers (past and current) mingle freely in an informal and non-press conference atmosphere, wine or beer in hand. The Test cricketers present, apart from Watson, were Simon Katich, Damien Martyn, Stuart Clark, Stuart MacGill and Tony Dodemaide. Equally satisfying for me was talking with journalists of years gone by such as Phil Wilkins, Norman Tasker, Robert Craddock, Jim Tucker, Ric Smith, among others. ACMA President and world renowned cricket author Mike Coward welcomed all present and spoke highly of the Award winner Shane Watson. But he did not gloss over Watson’s petulant behaviour in the Perth Test last month. The Award was presented to Watson by Stuart Clark. An entertaining vote of thanks was delivered by The Australian correspondent and ACMA Secretary Malcolm Conn.
With the formalities over, I had chats with the nervous 90 specialists of the current season Watson and Katich. Both of them were gracious enough to autograph my book The Nervous Nineties published in 1994. Katich recalled his three nineties (92, 99 and 98) of the current season and his 99 in the 2004 Nagpur Test against India with a smile but I dared not utter the word ninety to Watson as he had scored 97 on the very day. Ouch! “Take Watson’s autograph and run for your life”, was the light-hearted suggestion from the journos. I particularly enjoyed a yarn with Tony Dodemaide, who had represented Australia 10 times from 1987 to 1992 as a fast-medium bowler. He recalled to me his Test debut against New Zealand on the MCG in December 1987. Although a tail-ender he scored 50 in the first innings, adding 61 runs for the ninth wicket which gave Australia the lead. He also took 6 for 58 in the second innings including the scalp of top-scorer and classy batsman Martin Crowe. But more than his personal highlights, he remembered the heroic tenth wicket stand between Craig McDermott and Mike Whitney in the second innings. Set 247 runs for victory, Australia was 9 for 227 when Whitney joined McDermott with Richard Hadlee bowling menacingly, having already captured 10 wickets in this engrossing Test. But the Aussie tail held out for 4.5 crucial defend-or-die overs. Until the finish at 6.49 pm, Hadlee gave his best to dismiss the ‘rabbits’ Whitney and McDermott as 23,859 spectators watched in suspense. Elsewhere, Australians were glued on their TV sets as the high-rating quiz shows were cancelled for the evening. It was a draw but what a cliff-hanger! When Whitney dug out killer Hadlee’s final ball, the Kiwi legend put an arm around Whitney’s shoulder and shook his hand.